Where did you lose your Context Item? With Sitecore MVC a number of additional pipelines were introduced that were only run specifically for MVC requests. But does this affect the Context Item? The GetItem() method in the Sitecore.Mvc.Presentation.PageContext class in Sitecore.MVC.dll runs the mvc.getPageItem pipeline, which has a number of processors defined. One of those is Sitecore.Mvc.Pipelines.Response.GetPageItem.GetFromRouteUrl which resolves the Item (again) from the Route URL. When the pipeline returns, a number of checks are made, one of which is to check if the Context.Item.ID matches the Item returned, if not it sets Context.Item to the one resolved by the mvc.getPageItem pipeline. And then patch it in before the MVC pipeline that resolves the item again from the Route URL. The advantage of setting the result item to the Context Item and patching it before the default MVC GetFromFromUrl() pipeline is the code breaks out early so it doesn’t go through a whole bunch of logic to resolve the item only for you to go and reset it again. Now the Context.Item should be what you are expecting. Although this “reset” is important, you probably don’t want to be using Context.Item in MVC. 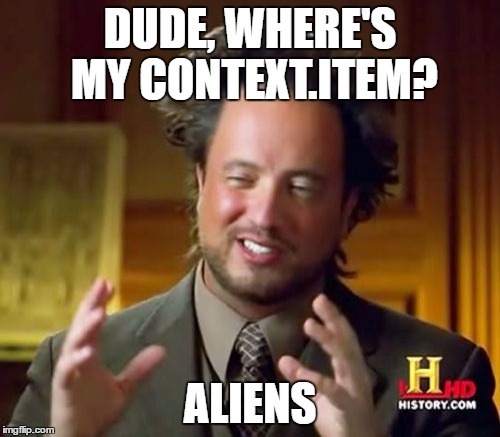 Take a read of Sitecore MVC Item Maze post by Pavel Veller, it’s really great detail on the different types of Item properties. What you probably want is PageContext.Current.Item (i.e. current page Item) or RenderingContext.Current.Rendering.Item (i.e. Datasource with fallback) but the above is an important and required step when using custom Item Resolvers.